Continuity mistake: Young Lucius kills a fly and Titus comes round the table to talk to him. There are several shots of the table. The position of Young Lucius' fork changes from the right hand side of his plate to the left. Continuity mistake: Aaoron is buried in sand at the end to die. His arms are covered with it, then in the next shot, they are clean. He can't reach them to brush them off and no one else did. Continuity mistake: The position of the spoon as Lucius jams it down Saturninus' throat. 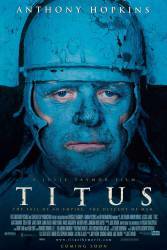 Titus: O handle not the theme, to talk of hands, Lest we remember still, that we have none. Tamora: Why do I have patience to endure all this? Titus: Rome is but a wilderness of tigers.